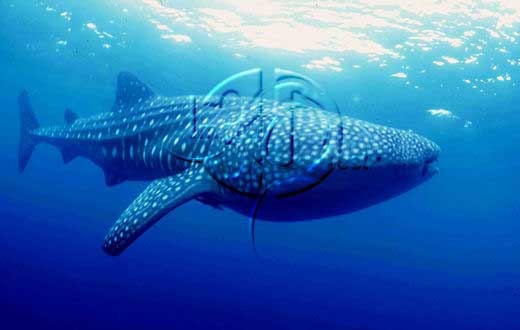 the Whale Shark is the largest fish in the sea, reaching over 15 metres and weighing over 15 tonnes. It is found, for example, off the ribbon reefs of the outer barrier of the Queensland coast, Australia and is seen in the open ocean waters at 30-40 feet. The species is readily recognised through such combined features as its large size, terminal mouth, the longitunidnal ridges running from head to tail, the pale spots on the sides which alternate with vertical stripes and the back-set position of th elarge first dorsal fin. Despite its massive bulk, it is quite harmless. It feeds at the surface on small crustaceans and other plankton which is strained by means of a "mat" of long gill-rakers from the water which is gulped in large mouthfuls and expelled through the gill-openings. Occasionally, a few small fish may be captured in the feeding process. The Whale Shark is usually seen cruising at a speed of 2 or 3 knots, and can present something of a hazard to small craft. It is a docile species, only rarely frightened by the sound of an oncoming motor. The Whale Shark should not be confused with the Whales themselves; it takes its name only from its extraordinarily large size and from its habit of feeding on plankton - a character of the baleen whales. Click here to view the 'Picture of the Week' archive. For Terrestrial Images visit our sister library by clicking on the flower below.